I know I've been more absent from the blog these days than I really should be, but Real Life (TM) has been happening, keeping me off the online world--even off Twitter and Instagram and facebook, which, in all honesty, is quite refreshing. It's been a lesson in remembering how to experience life and how to find joy and emotions in the world and in our actions without the pressures of reporting all the gory details online. Though it's a bit of a work-in-progress, I think this re-connection to the Real World is necessary every now and then to keep myself grounded. In the past few weeks, as Online Life keeps speeding along without me, I celebrated my last mid-20s birthday. (Next year, I officially enter my "Late 20s," which is terrifying, given all that I haven't yet accomplished!) On my birthday, we had a wonderful dinner with a few of my closest friends at my favorite neighborhood Italian restaurant, replete with creamy gnocchi pesto, my favorite lobster and shrimp risotto, and housemade, sweet limoncello (highlights amongst numerous other delicious dishes). Then, a few days later, more close friends gathered at a big backyard BBQ to continue the celebration. All being foodies (though many not of the blog world), the BBQ was packed with chipotle BBQ cherry pizzas, grilled chicken and portabello mushrooms with chimichurri, buffalo grilled shrimp with blue cheese dip, garlic soy chicken wings, fennel lychee spring rolls, olallieberries and raspberries and melon and prosciutto, virgin and non-virgin margaritas, Dynamo Donuts, grilled corn with lime and paprika, sesame fried mochi and mochi cupcakes, so many types of whole grain salads, and more and more to stuff one's face and stomach with. But more importantly than the bounties of food was the realization when we went around introducing one another that every single one of my friends is so uniquely cool, and that I'm blessed to be surrounded by some of the most creative, kind, hilarious, talented, smart, and amazing people one could imagine. For the rest of the past few weeks, between work and work, there was also that weird July 4th that happened smack dab in the middle of the week. Then, I finally got a new refrigerator to replace my poor old dying contraption that kept melting all of my popsicles and ice cream for the past few months--a special thank you to my parents for that! Of course, the first thing I put in there was my ice cream maker, so hopefully there will finally be proper homemade ice cream/gelato/sorbet cranking out of the desserts for breakfast kitchen soon. :) The big fridge move/clean-out also coincided with helping one of my good friends in the area with her big move and packing, so it's been a lot of lifting and taping and cardboard and bubble wrap for me in the last few days! P.S. 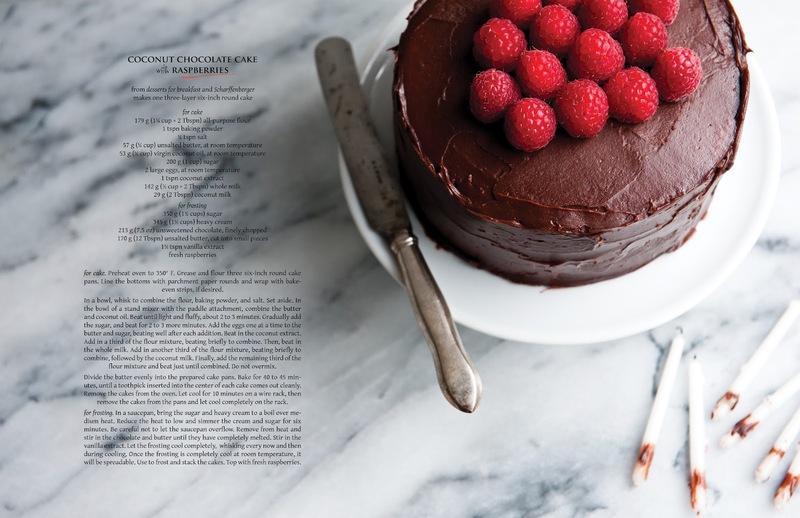 Don't miss a few interviews about sated magazine on Foodie Bugle and BlogHer Food! 1. for cake. Preheat oven to 350° F. Grease and flour three six-inch round cake pans. Line the bottoms with parchment paper rounds and wrap with bake-even strips, if desired. 2. In a bowl, whisk to combine the flour, baking powder, and salt. Set aside. 3. In the bowl of a stand mixer with the paddle attachment, combine the butter and coconut oil. Beat until light and fluffy, about 2 to 3 minutes. 4. Gradually add the sugar, and beat for 2 to 3 more minutes. 5. Add the eggs one at a time to the butter and sugar, beating well after each addition. Beat in the coconut extract. 6. Add in a third of the flour mixture, beating briefly to combine. Then, beat in the whole milk. Add in another third of the flour mixture, beating briefly to combine, followed by the coconut milk. Finally, add the remaining third of the flour mixture and beat just until combined. Do not overmix. 7. Divide the batter evenly into the prepared cake pans. Bake for 40 to 45 minutes, until a toothpick inserted into the center of each cake comes out cleanly. Remove the cakes from the oven. Let cool for 10 minutes on a wire rack, then remove the cakes from the pans and let cool completely on the rack. 8. for frosting. In a saucepan, bring the sugar and heavy cream to a boil over medium heat. Reduce the heat to low and simmer the cream and sugar for six minutes. Be careful not to let the saucepan overflow. 9. Remove from heat and stir in the chocolate and butter until they have completely melted. Stir in the vanilla extract. 10. Let the frosting cool completely, whisking every now and then during cooling. Once the frosting is completely cool at room temperature, it will be spreadable. Use to frost and stack the cakes. 11. Top with fresh raspberries. Note on coconut milk: Make sure to mix the coconut milk before using so that the cream on top of the coconut milk is mixed in. Do not use just the milk with no cream. 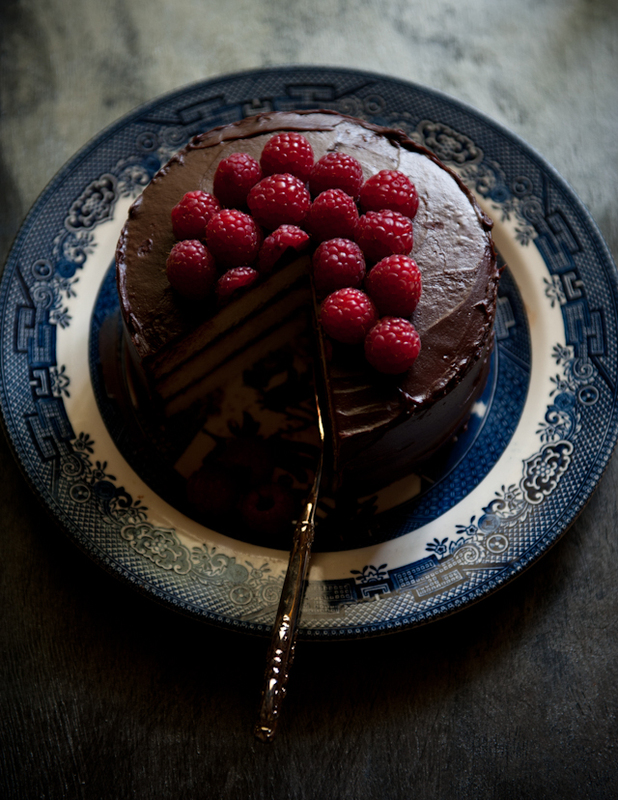 Note: For a three-layer eight- or nine-inch round cake, double the recipe. When I was reading your post about the various ways to photograph this cake, I was actually kind of sad that it didn't include a recipe, it looked so scrumptious. So hooray! Happy belated birthday Stephanie! Kudos on backing off social media for the sake of real life. I did the same earlier this year for a spell and also found it refreshing; it can easily replace real life if one lets it! You BBQ looked very fun (and delicious). Love the photos in this post as I do Sated mag. Ordered myself a copy and some for friends. It's nothing less than extraordinary! When is issue 2 coming?! Happy belated birthday! Don't worry, in my late 20's I was still a grad student then postdoc and had never had a real job! I'd say you're doing well :) Great looking cake too, I'm intrigued by the coconut/raspberry combo! your food and also your pics look amazing....why didn't i find your blog earlier??? I think we should all take a little break from social media/the internet once in a while. Easier said than done, I know, but imagine how many more fun things we could try if we gave ourselves a little extra time to experience things in person rather than through a screen? Kudos to you! This is absolutely stunning! Awesome cake! I've been taking some time off from the online world too: I graduated from my master's program, got married and moved all within the last few months. It was time to take a step back and reconnect with the physical world. This cake looks and sounds sooo amazing! I wonder how it would work out with gluten free flour? I think I might have to give it a try. yup yup yup, i've been taking like a 2-mth break from social media. just starting to get back into it. also, yay for your birthday! it was so fun. so much good food. PS: you have marble???? i've been dying to get some marble just for food shots. your blog looks amazing, I have nominated it for one lovely blog award in my blog. 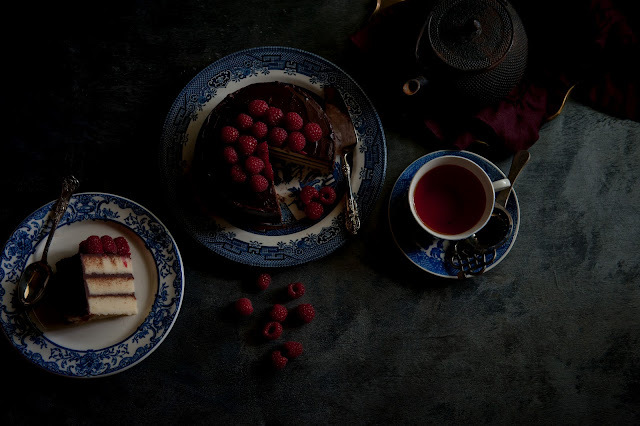 Delicious chocolate and raspberry cake . . . still enjoying it so much. You are so talented! hm... that's odd. I've made this cake several times already--in the 6-inch size though--and it hasn't given me any problems. I have yet to try it personally as a 9-inch, but it shouldn't behave much differently. Are you using weight or volume measurements?